What is Bee Pollen? I get this question a lot. People expect that as the beekeeper's daughter I should know every bee pollen fact. 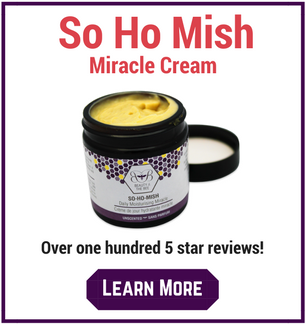 So I feel like it is my duty to ensure that after reading this you will know the inside scoop on what bee pollen is and exactly where it comes from. Lets get started. 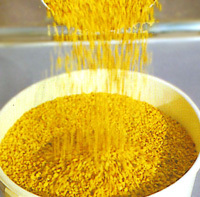 Bee Pollen is orange/yellow in color and it comes in little granules or pellets. It comes from the pollen nectar from the flowers (the dusty stuff that you see on blossoms in the spring). Every variety of flower in the universe has a dusting of pollen. There is the air borne wind carried type that gives you your hay fever (the scientific name is Anemophile pollen). And there is the kind that sticks to honey bees and comes from blossoms (the scientific name here is Entomophile pollen). 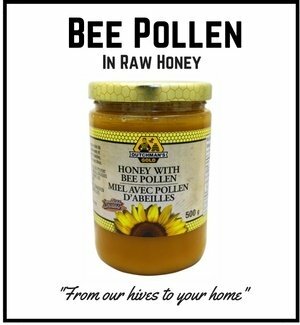 The Bee Pollen we consume is in fact Entomophile pollen with a very important touch of “magic” from the honey bee. The Honey Bee is an amazing insect – the story of how they collect the bee pollen is quite interesting. The bee arrives at the flower and grabs some of the powdery dust from the flower with her front legs. These worker bees are all female. In the hive setting there are Worker Bees, Drones and one Queen. 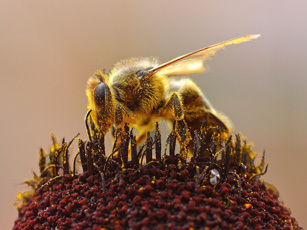 The workers are all females – usually about 30,000 per colony while the drones are the males who don’t do any work – (the poor guys were born without stingers or equipment to gather pollen or honey) – they are there to mate with the newly born queen on her mating flight. There are 500 to 2000 drones per colony. The Queen Bee (there is only one per hive) is the Mother of the hive – her job is to lay eggs and perpetuate the species. Without this delicate order, the colony would collapse. Bee Pollen can only be synthesized by a honey bee (the worker bee). So bee pollen can’t be made in a factory! 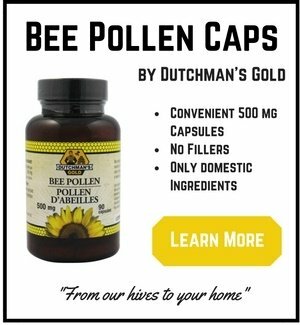 Among all the superfood properties found in bee pollen, there are actually trace elements found in bee pollen that cannot even be identified through modern science. Perhaps this explains why bee pollen has been used to treat a whole host of ill health complaints. Pollination is accomplished when the golden dust (mixed with the honey this is like fairy dust that is necessary to fertilize the blossom) is transferred to the blossom. If it weren’t for the Honey bee pollinating our blossoms, 80 percent of growing things would not go to full bloom. So in the grand scheme of life, we can say that the bee's primary duty is to pollinate. 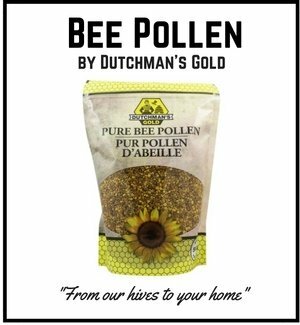 As a nutritionist, I have found that it is very rare to find a profile like bee pollen's in a single food. When vitamins come in a food base such as bee pollen then they are MUCH EASIER to absorb and digest. Bee pollen is a food with about a 25% carbohydrate, 20% protein, 4.5% fats and the rest is pigments, minerals, vitamins, water and other substances. Bee Pollen appears to be high in trace minerals such as copper as well. The B vitamins are high as well showing promise for energy and stress. It is also very high in bio-flavonoids and antioxidants - possibly explaining the positive effect on allergies. This would also be an excellent choice for vegetarians who find it hard to get protein, all of the essential amino acids, vitamin B12, and iron. So as you can see, bee pollen gives you more than just a BUZZ!